How To Disassemble A Round Above Ground Swimming Pool? With the start of the summer season, people start spending time in the water. When they have personal swimming pools, then things get a lot more exciting. Swimming pools are available in different shapes and sizes, but when it comes to the most common one, then it is surely the round above ground swimming pool that takes the top spot. With a high level of versatility, round above ground swimming pools are the number one choice among the people. There are various reasons behind the popularity of round above ground swimming pools, like they are easy to remove, move and store when not in use. But, the process of disassembling the swimming pool could be a bit of a challenge. 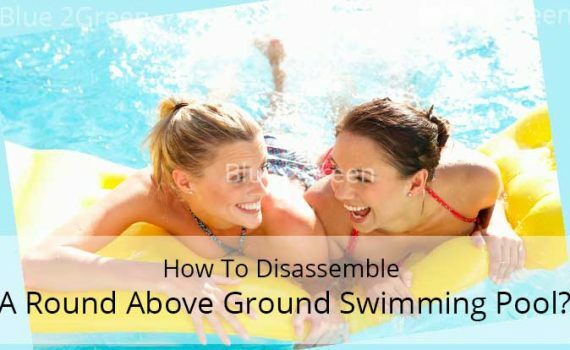 The right approach of taking down the round above ground pool is, starting off the disassembling in the opposite order. If you haven’t put the swimming pool together, then it won’t be much difficult for you to take down the pool. 1. The process starts off with removing the drain cap that is placed on the outer part of the swimming pool wall. You will find the usual garden hose that will fit in there. 2. One end of the garden hose will be attached to the drain and then, you will run the hose to the area where you want to drain the water. 3. To ensure smooth flow of the water, you need to take off the drain plug, which is placed on the inside of the swimming pool. 4. Use the hose connection to get as much water as possible out of the swimming pool. Once the water is out, take out all the things from the swimming pool such as, ladder, lights, return inlet and alarms. 5. When the level of water is below a meter or so, then you can disconnect the hose, as the water couldn’t be drained through it. 6. For the remaining water, you can use a bucket or rags. Make sure that the swimming pool is fully dry. 7. You will also have to remove the pump and the filter. If there is skimmer installed as well, then, that will also be disassembled. While removing the filter and the pump, remove the drain plugs and allow the water to run out. 8. If there is any dirt or debris in the pump basket, then make sure that you clear all of it. The filter medium, which is either a cartridge or sand must also be emptied. You should also get the plugs on the filter and pump replaced. 9. Remove the post caps followed by the top ledge of the swimming pool. The framework of the swimming pool has a plenty of plastic latches or buttons, so you have to slide each one of those in order to take the pool apart. Some swimming pools come with pins, so if that’s the case with your pool, then you’ve got to remove the pins before separating each piece. 10. Clean all the parts of the swimming pool, so that when you use them again, you don’t have to deal with rusty and corroded parts. You can prepare a solution of soap and water, and clean all the parts with it, including the pool liner. Rinse all the parts and keep it in the open to dry. 11. Once the liner is fully dried, you have to roll it up and keep it and all other parts in a dry location. 12. If you have placed any solar blankets, ladders or leaf covers, then you have to clean them with water, then dry them and finally store them along with other parts. 1. If you can take pictures of the swimming pool before disassembling it, then it’ll be great. You must also take pictures while removing each part of the pool, so that you can reassemble it in the future. 2. Don’t use detergent and hot water to wash the parts. Use a mild soap and lukewarm water instead. 1. After washing the parts, keep them in the open to dry. If they are not properly dry, then there are chances of mold and mildew formation.